Nomadic culinary collective Ghetto Gastro probably do not look like your typical chefs. In fact, there are likely few chefs who would know the name Rick Owens, never mind be dressed head-to-toe in his clothes. But for Jon Gray, Pierre Serrao, Lester Walker and Malcolm Livingston II (also the pastry chef at Noma, arguably the world’s finest restaurant), cooking is more than just a day job – it is something that is intrinsically linked with a wider sense of culture. And it is this idea that runs through their work, which blends the lines between food, fashion, music and art. Launched in 2012, the collective create one-off experiences centred around but not limited to food, often building in some form of unique narrative. Their approach has seen them paying homage to the hedonistic days of 80s Miami at Art Basel (serving lines of crushed coconut were served on mirrors), to altogether more arresting and political food experiences – the collective’s recent ‘Black Bodies’ dessert championed the cause of Black Lives Matter with a chalk outline of a body on the plate. On any given day, they could be in the south of France catering a meal for executives at Microsoft, sharing a thanksgiving dinner with Rick Owens and his team, or hosting an event at Paris Fashion Week – something they did just a matter of weeks ago, with DJ sets by A$AP Bari and Venus X. In a world where so much can be experienced online, food is perhaps one of the few remaining “live” experiences – and Ghetto Gastro are seeking to deliver that in its most potent form. Here, Jon Gray – the business mind behind the collective who self-effacingly refers to himself as “the dishwasher” – speaks to us about the origins of Ghetto Gastro, Bronx culture and creating cultural commentary with food. 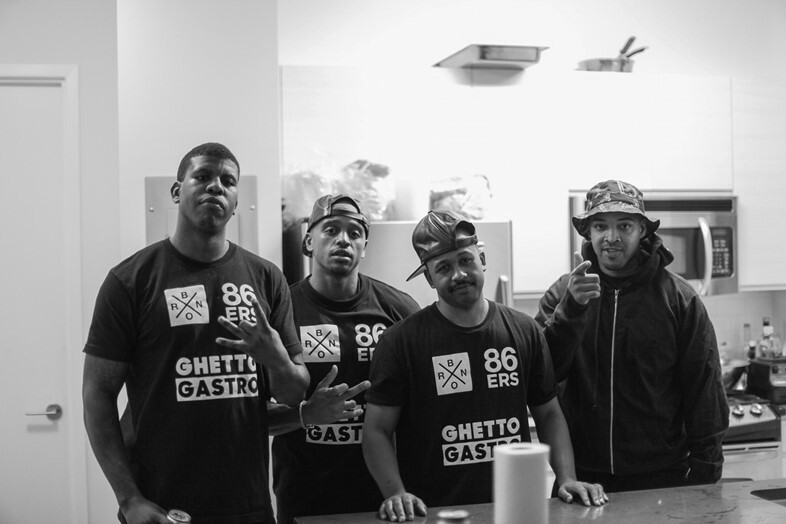 Can you tell us a little bit about how Ghetto Gastro came about and what it is you guys do? Jon Gray: I was working in fashion and had hit some hard times. I’ve always been a creative guy and enjoyed making things so I felt like fashion was the right outlet. I had some success with a denim company with some partners from F.I.T. (the Fashion Institute of Technology) but then when the market crashed in 2007/8, we didn’t have any outside investment so it kinda just became a nightmare financially. After some soul searching I realised food is the one thing that I really enjoy and I spend all my money on, so I might as well find a way to make it my life’s work. Me and Lester, we grew up in the same neighbourhood and we were always talking about doing things together. So I came up with the title Ghetto Gastro and was like: ‘Look, we’re both from the streets, let’s figure out how to have a narrative, or an autobiographical experience using food, and ways we can inject that into art, fashion, design.’ I already had a lot of relationships and a small understanding of these different worlds. I was like, let’s bring food and Bronx culture into it. What is it that makes the Bronx so unique and how does it inform your work? Jon Gray: I think it’s a rich tapestry of different ethnic groups that come together. Even just growing up, I didn’t know that it was uncommon to speak a little bit of Spanish conversationally. I had a lot of Puerto Rican and Dominican friends, I would go and eat with their families, so I was exposed to different types of food and seasonal drinks like Coquitos. Then as I got older, (I started) tapping into West African, Ghanaian, Nigerian, Sierra Leonean, Trinidadian, there’s even a small Vietnamese population – it’s a lot of different vibes. The Bronx in very important to us. Coming of age in the 90s and early 2000s it was a very unique time. And I’m sure it was the same no matter what block you grew up on, whether it was Brooklyn, Harlem or the Bronx. But I feel like in terms of hype, press, and investment, the Bronx has been a little bit underserved. Of the Five Boroughs it is the most impoverished. I think it’s important for us to celebrate different attributes and some of the positive things that come out forced creativity. In the past, you’ve spoken about using Ghetto Gastro to “empower communities,” can you explain what you mean by that? Jon Gray: It’s thinking about how we create. When I was a kid I was attracted to things that were cool, I wanted to spend my time doing what I wanted to do without thinking about what was the social good of it. For me, it’s about doing business in a new way where it intrinsically has some benefit for the community. Because, you know, you can’t just be screaming ‘The Bronx! The Bronx!’ and getting in magazines cause it sounds cool. So I think for me, the first step is to set and example and just be. Just by being who you are, that’s a form of activism in itself, because when I was growing up, young black men like me and my partners out here doing different things and living their dreams. People might not have thought of food as an option or vocation that can take you around the world and living this life that some might consider dope. Personally I’m really looking forward to space creation and thinking about how we can develop neighbourhoods and real estate in an engaging and empowering way. Thinking about different design projects and collaborations – I’m really big on collaborations across disciplines – so thinking about how we can collaborate with architects and different types of design professionals to have engaging and empowering design implementation in the Bronx. Your work also seems to have crossed over into fashion on more than one occasion – you recently hosted an event at Paris Fashion Week. How did that come about? Jon Gray: We do this party called Waffles + Models, we saw this great space that was put on our radar by my friend Etienne from Untold Stories. Etienne and Samira Cadasse are our liaisons in Paris, so they were part of getting us out there for the first time for our collaboration with Rick Owens and Michele Lamy for Thanksgiving. We put together a really cool family event after the attacks happened at the Bataclan. Spirits were down a bit, so Rick and Michele wanted to do something for their team and friends in the area that represented a community thing – so that was like the Thanksgiving in Paris vibe. And ever since then we’ve been jamming with Michele on a bunch of projects, we’re going to be doing some cool things around the world and in the Bronx. 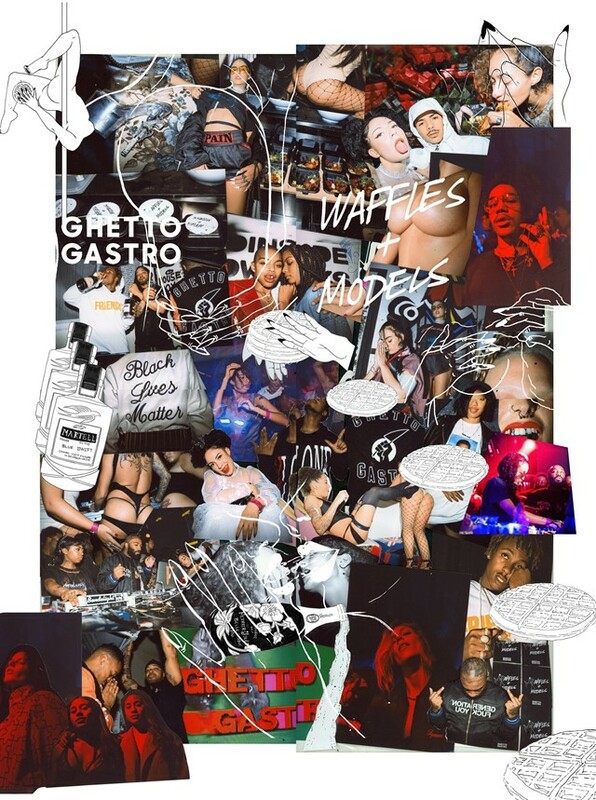 So yeah, Waffles + Models, we went out there with the intention of doing this party.’ The idea for this version of Waffles + Models was to really just like with other young creatives that we respect from New York. I think we represented every borough except Staten Island with the line-up we had. It was a moment in Paris that wasn’t necessarily connected with a high fashion brand that was showing clothes or sponsored by a magazine for advertisers – it was all about bringing that Bronx energy to Paris, breaking some rules and disrupting the week a bit. 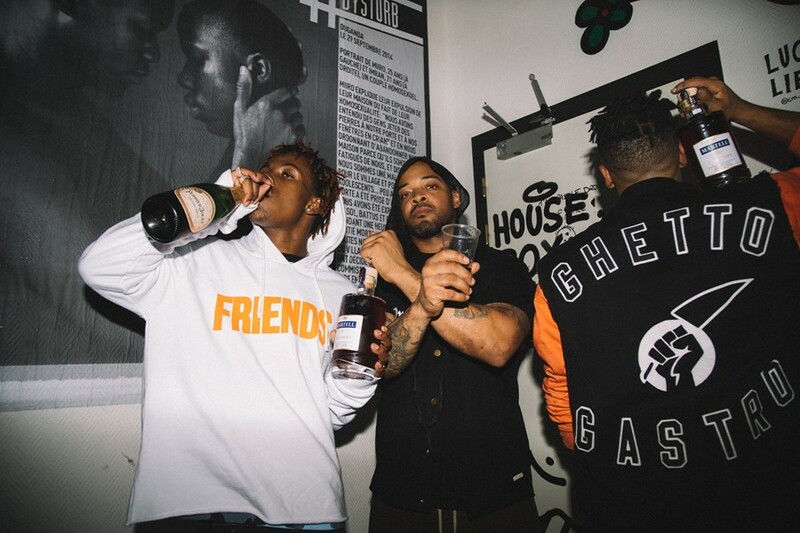 You’ve also hosted parties with fashion brand Pigalle at Art Basel in Miami. One dish in particular stood out from that event, which was lines of crushed coconut served on a mirror. Do you set out to play with preconceptions with your dishes? Jon Gray: Yeah it’s always about seeing how we can push ourselves and see how we can create a reaction on the palette but also on the plate – and that was part of what we did at Art Basel with Pigalle in Miami. For me, because we’re from the streets and the movies I grew up watching, when I think about Miami, it’s Cocaine Cowboys, Scarface and 80s Miami – a lot of cocaine, money and partying. I was like, how can we create a dish that feels like that, but is also really tasty, and that’s one of the things we came up with. It caused quite a stir at the party, even the owner of the mansion was complaining, because they had spies in there, like ‘yeah there was a lot of drugs at the party’… Nah, it’s just food man. You also recently presented a dish championing Black Lives Matter. Can you tell us about that? Jon Gray: We did a dinner with Hank Willis Thomas inspired by Franklin D Roosevelt’s Four Freedoms speech. And the four freedoms are, off top: freedom of speech, freedom from fear, freedom from want and freedom of worship. For freedom from fear, that’s the one considered the ‘Black Lives Matter dessert’. We’ve always been into making people feel uncomfortable, and we felt this plate might do that. Freedom from fear to me is the black man in America, and a lot of the powers that be, they fear us. It’s fear of the black body. The black body is being abused and murdered on these streets for the world to see, so we did an outline of a body in chalk. And then Hank, he was like ‘let’s do something really American’ so we did a deconstructed apple pie. We used different types of apples, and it was called ‘black bodies’. Can food be a form of activism? Jon Gray: Yeah for sure. There’s so many forms of activism. It’s a different approach. There’s a non-profit approach to activism, there’s an entrepreneurial approach to activism, there’s a so many ways to get a point across and get things going.